Could the Cowboys look to the Fighting Irish to replace David Irving? The offseason has begun and the Cowboys are likely to be moving on from David Irving, meaning the 3-technique defensive tackle spot could use some help. 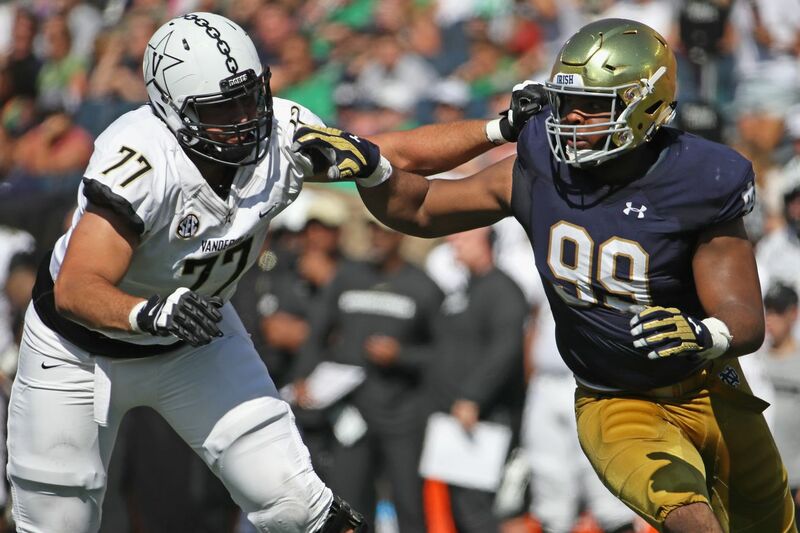 There are a few free agents the Cowboys might try to target to fill that hole, but there are also some great prospects in this draft, which is saturated with talent along the defensive line. Notre Dame’s Jerry Tillery is one of those prospects to look at. Originally recruited to Notre Dame to play offensive tackle, the coaches quickly realized he fit better as a defensive tackle. Over the next four years, Tillery played in 42 total games and became the full time starter as a junior. Throughout his full career in South Bend, Tillery notched 12.5 sacks and 23 tackles for loss. The first thing that sticks out about him is his sheer size, which translates to great strength in taking on interior linemen. He has length that allows him to knock blockers backwards when he fully extends and times his punches correctly. The issue there is that Tillery sometimes gets lazy with his arms and tries to simply overpower blockers instead of using his full potential. He can compensate for that because of how quick and overwhelming he can be. When watching the Notre Dame defense in 2018, nine out of ten times the first guy to react to the snap of the ball was Tillery. He gets out of his stance quickly and does a good job of channeling his size into engaging with offensive linemen. It’s when he engages with those blocks that trouble starts to happen. In running situations, Tillery doesn’t offer much in the way of lateral quickness or ability to move along the line of scrimmage. His hand placement sometimes makes tackling more difficult than it should be, but Tillery’s great size and length makes up for it, as he’s able to bring down running backs with just one arm. Tillery also doesn’t appear to have a deep repertoire of pass rushing moves, he prefers to just rely on his overpowering strength to reset the line of scrimmage and pressure the quarterback. He took a step forward in his senior year with getting home on those pass rushes, but doesn’t fit the ideal mold of a 3-technique in the Cowboys defensive scheme. Tillery is admittedly hard to project because he showed steady improvement each year in college, and if he is given ample patience in the NFL he could develop into a star. And perhaps Rod Marinelli is exactly the kind of teacher he needs to make that leap. However, watching his tape leaves the impression of an underachiever when considering Tillery’s natural gifts. He can be effective in a rotational role in Dallas that focuses on using his insane strength properly, but if the Cowboys want Tillery to become their long term answer at the 3-technique spot, they better sign someone in free agency for now, because they’ll have to wait and see if they draft him. The other problem is that he might not even make to the Cowboys spot in the draft. Already, some mocks are putting him at the tail end of the first round. At this point that seems a little high, but for him to slip all the way down to the 58th spot would take some serious luck.